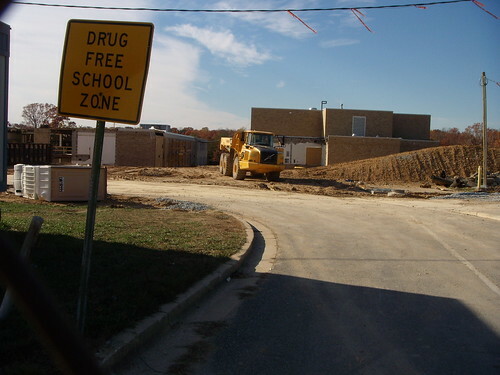 WHEN THE KIDS ARE AWAY, THE DRUGGIES WILL PLAY: Galway Elementary in Calverton stands firm on its no-drug policy, even while the school's shut down for renovations. Okay, so I said that we'd take a few days off from the ongoing Live Nation/I.M.P. spat in Downtown Silver Spring. I wonder if you (The Reader) is starting to think "man, all JUTP writes about now is the Fillmore and the Purple Line! I am so bored!" Oh, well: Howard County Executive Ken Ulman has thrown his hat into the ongoing controversy over whether or not Montgomery County should consider other companies than international concert promoter Live Nation to run a proposed music hall in the former J.C. Penney building on Colesville Road. The Silver Spring Scene has the full text of Ulman's letter to MoCo Executive Ike Leggett. what'd Ulman say? and why does one civic leader say Live Nation should be left alone? find out AFTER THE JUMP . . .
"Merriweather’s relationship with the community has not always been perfect. Most notable in Columbia lore is the appearance of the Grateful Dead in the 1980s, whose traveling fan base caused enough havoc in our community to prompt local leaders to ban the band from playing there again. Fears of a similar nature arose in 2006 when Merriweather was scheduled to host the HFStival, a two-day, 50,000-person festival with multiple stages. Seth, however, quickly assuaged these fears, as he worked with community leaders and residents to implement a plan for handling the largest crowds in the pavilion’s history." While this letter may not force Leggett to reconsider his position, as the Silver Spring Citizens Advisory Board insisted he do two weeks ago, it does give the I.M.P. camp a powerful reference. In the light of Hurwitz' counter-proposal earlier this month, Montgomery County hasn't done enough to assure concerned [tax-paying] residents that the millions of dollars in subsidies for the music hall are going to the right place. But the County may have good reason to stick to its guns, says one local activist. Over the weekend, Mike Diegel, who we met at a press conference last September announcing the tentative agreement with Live Nation, told JUTP that this isn't the first time Montgomery County's selected a company to do a project without public input. During the 1990's, developer Foulger-Pratt was selected to build the Downtown Silver Spring complex without use of a Request for Proposals, or RFP. "One of the reasons why [Downtown Silver Spring] worked was because [Doug Duncan, the n-executive] did do that," says Diegel, who served on the Silver Spring Redevelopment Committee from 1996 to 1998 and is currently president of Allied Civic, an umbrella civic group. Previous developers had previously courted the County for the opportunity to redevelop Downtown, but there was no process for them to do it through. In addition, Diegel suggests, Live Nation's "connections in Hollywood" could give them heft with Discovery Communications and the American Film Institute, both of which are located across the street from the proposed music hall. That could mean programming that a local promoter couldn't deliver. "I'm fine with what's going on," adds Diegel, a regular patron of the 9:30 Club. "We elected these folks to do this job . . . they knew folks were committed to music Downtown. It's a good fit. I'm looking for a quality operator and quality entertainment."